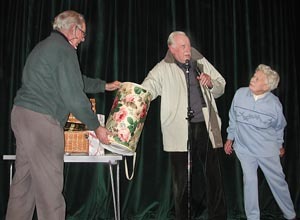 Grand Draw Results: The Grand Draw for The Theydon Bois Village Association raffle took place in the Village Hall after the Christmas Tree Lighting Ceremony on December 7th. The total proceeds of the Lottery was £3831.50. £1000 was used for the 1st prize and expenses totalled £177.18. All other prizes were donated for which many thanks. So we are able to put the net profits of £2,664.32 into the Building Fund for the New Village Hall. The committee was very pleased with these results and are grateful to all the many people who have helped in selling the tickets and raising this considerable sum. 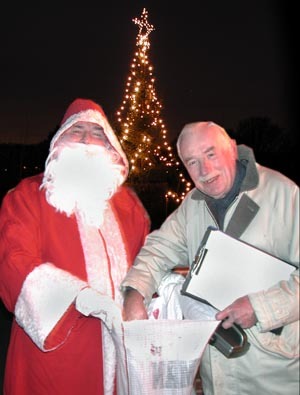 LIGHTING OF THE VILLAGE CHRISTMAS TREE: Theydon Bois entered the spirit of Christmas with the lighting of the Village Christmas Tree on Friday 7th December at its new position, in front of the Village Hall. Earlier in the year the Parish Council decided that on The Green was no longer a suitable position, due to the excessive rainwater that accumulates there making it very muddy, also the problems of the road traffic and the electricity cable above the road. A good crowd assembled on a dry hardstanding and commenced with the Parish Council Chairman, Wilfred Shales, extending a welcome to all there, enjoying the event. He also thanked the shopkeepers for their support, Theydon Bois Bakery, Book Shop, Off Licence and the Pet Shop who kindly arranged the sleigh for Father Christmas on his arrival in the Village from Lapland. He also extended thanks to the W.I. for refreshments and the Guides for their help. 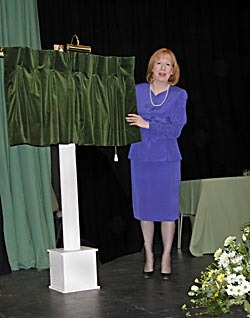 This was followed by the lighting of the tree by Sally Mc Meekin, who in July received the Theydon Bois Citizen of The Year Award for her many years of work with the Day Centre. Carols were led by the Theydon Bois Singers, the children from the primary school sang their Christmas Favourites and Rev.David Penegar gave a prayer and blessing. To the delight of the crowd, and particularly the children, Father Christmas then arrived on a beautifully illuminated sleigh drawn by a reindeer, which really was a lovely pony in disguise, and distributed sweets to the children. Mulled wine and hot chocolate followed in the Village Hall. During the event a collection was made for charity , this year it was for The Guide Dogs for the Blind Association, who rely entirely on public support. Graham Routledge with his 2-year-old guide dog named Ingrid attended and both were made very welcome. Lighting of the Village Christmas Tree: This Friday the 7th of December at 6.30pm will see the lighting of the Village Christmas Tree. This year the tree will be the "live one" provided by the Rural Preservation Society as part of the Landscaping for the New Village Hall where the ceremony will take place. As well as the usual carols and mince pies there will also be an opportunity to see the New Hall and there will be the Grand Draw of the Village Association Raffle that benifits the New Hall Fund. Don't miss this event much loved by the Village children ,you may even be a winner. Mini Market: Saturday 15th December from 11am - 3.00pm see's the St. Mary's Christmas Mini Market at St. Mary's Church Hall. This will be a great opportunity to pick up those last minute presents and stocking fillers. There will be Handicraft Items, Unwanted (new) Gifts, Cakes, Pies, Jams ect. A soup lunch will alsop be available. For further details or to help out on the day contact Joy Simmance Tel: 01992 815894. Mrs. Eleanor Laing, M.P. 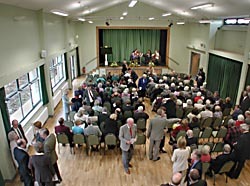 Opens the New Hall. Sunday 4th November will be added as a day of great significance in the long history of our village, after over seven years of hard work by many members of the village community the New Village Hall has finally been opened. Mrs. Eleanor Laing, M.P. managed to find time from her own happy event, the christening of her first baby, to carry out the official opening ceremony. 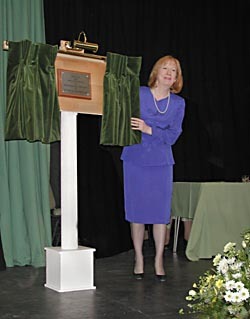 She thanked all involved for their hard work and said the New Hall was a great asset and credit to our village. Over 300 village residents and guests also heard speeches of appreciation and thanks from; Wilfred Shales - Chairman Theydon Bois Parish Council, Cllr. John Padfield, Joy Wainwright & Marjorie Chapman of the Village Association. The Reverend Canon David Driscoll led the Prayer and Blessing. 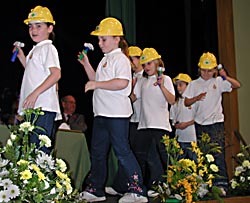 Those present were also entertained by the Davenant School Quartet and a wonderful performance of 'Bob the Builder' by Theydon Bois Girls' Brigade. Displays were mounted by the T.B. Rural Preservation Society, The Local History Recorder, The Tree Warden and this Web Site also put on a demonstration. We are sure that the hall will become a popular and pleasant venue for both public and private functions and with the support of us all its future success will be assured. Crime & Disorder Audit: Theydon Bois Community Safety Group have just published the results of the audit. 1,775 forms were circulated and a total of 629 audits were completed and returned. This was a response rate of 35%. In total the views of 1,072 local residents and businesses are represented in the audit. The respondents listed the three main categories of concern as 1. Burglary. 2. Vandalism. 3. Youth Anti-Social Behavior. The immediate work of the group is to identify resources and funding available to them so that an action plan can be produced to tackle each issue. In order to begin work a second Public Meeting will be called to discuss the audit, identify additional resources and listen to ideas of ways of attacking each issue. We will up date you on the date of this meeting soon. The public meeting has now been arranged for Thursday 24 January 2002 (probably at 8p.m.) in Village Hall. New Village Hall Photos: Only a few days to go to the Official Opening Ceremony but to see Trevor Roberts pictures of how we got there Click here. Parish Council Minutes:The Theydon Bois Parish Council minutes for the 25th Sept. meeting are now posted and contain more news about the village. Click here. THE ROYAL BRITISH LEGION: The Annual Royal British Legion Service of Remembrance will be held on Sunday 11th November 2001 starting at the War Memorial at 10.45am. Those wishing to join the Parade should meet outside the telephone exchange ready to move off at 10.30am. Medals may be worn. The Venerable Peter Taylor, Archdeacon of Harlow, will lead the service. In July this year the Legion celebrated it's 80th birthday. Formed in 1921, the Flanders Poppy was adopted as the symbol of the Royal British Legion and they appear every year in late October on street corners, in shops and in collectors' trays. Our poppy factory in Richmond employs many disabled service people who produce in the region of 35 million poppies, plus wreaths and crosses each year. 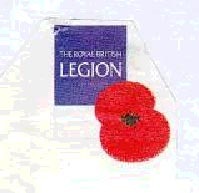 The Royal British Legion is a charity whose work is to help disabled service and ex service personnel and their families who need assistance. Most of their work is done at local level by volunteers who give their time and effort and who do an excellent job of "helping" needy ex-service people in the area. Part of my appeal this year is to the younger generation. Us World War II veterans, now in the autumn of our lives, will need the younger age group to continue the work of fund raising and organising when we have passed on. Wars and conflicts will happen in future years. (There have been over 20 serious conflicts since 1945 including the Falklands and the Gulf Wars) and which give rise to cries of help from the charity. Please do give generously when you see the poppy sellers around (there are 180,000 of us) or if they call on you at your home and please do "Wear your Poppy with Pride" It is hoped that all of us will pause for 2 minutes at 11 am on Sunday November 11th, just to remember. 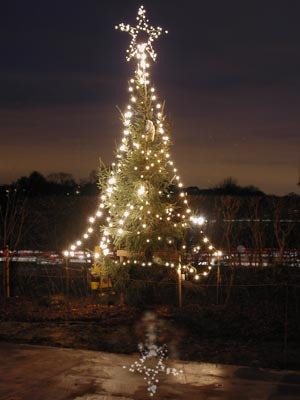 LIGHTING OF THE VILLAGE CHRISTMAS TREE: FRIDAY 7TH DECEMBER at 6.30pm In front of the new VILLAGE HALL. We hope to make this a very special event to celebrate our new venue, so please note this in your diaries NOW. THEYDON BOIS PARTNERSHIP: The first meeting took place on Wednesday 19th September when an outline of the purpose of the Partnership was discussed. Representatives of the Parish Council, Village Association, Churches, W.I., & Scouts took part. It is hoped that other organisations in the Village will take part in the next meeting; we do hope that a representative of businesses will also attend. We are very fortunate to have a volunteer, in Peter Simmance, to lead the team to organise the Jubilee Celebrations 2002 and the date planned is Monday 3rd June, so all make a special note in your diaries now. Other events that it is hoped the partnership could arrange in future years include, Front Gardens Competition in co-operation with the Horticultural Society, Anglia In Bloom and the Christmas Tree Lighting event, we will be looking at other ideas for the benefit of the Village. We do want more of the organisations and clubs that meet in Theydon Bois, together with any of our other residents who are willing to help the Partnership to come forward and for this purpose our next meeting is open to the public, please come along and offer your support. DATE OF NEXT MEETING: Thursday 18th October at 7.45pm in The Baptist Church Hall, please enter from the side in Avenue Road. ANGLIA IN BLOOM: The presentation of awards for this competition took place o the 11th September at Southend on Sea and a representation from Theydon Bois attended. Once again Filby, a village in Norfolk swept the board attaining a number of trophies and they were declared the Overall Winner for 2001. 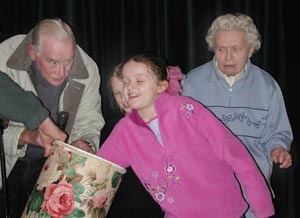 Theydon Bois was not successful this year, in our category Brightlingsea were the winners. Anglia In Bloom is recognised as a prestige competition. part of Britain In Bloom and as such each year the competition for awards grows considerably. The enthusiasm of the Towns and Villages that took part was so noticeable and we realised that many of them have a group of people who work all the year to plan and promote locally the event. This is what brings them their success and if we are to be a winner in the future we shall have to follow this pattern. The Judges who visited the village passed some very favourable comments on the Churchyard, they said this remains a jewel and praised the efforts of the dedicated team of volunteers. Also the Front Gardens Competition, The Village Green, pond and particularly the new seats and the litter free appearance of the village as a whole all also received very favourable comment. Village Hall Up Date:With licensing and certification approval the Montessori school now has access to the multipurpose room. Entrance via the service entrance. The rest of the hall is steadily being made available. The car park, including drainage, still awaits final completion. The Opening ceremony is confirmed as 12 noon on Sunday 4th November. Cllr Padfield reported that a subcommittee of those involved in running the old hall would be meeting to draw up a job specification for a Hall Manager. In reply to Cllr Eaton Cllr Padfield reported that the line of the service road kerb had now been corrected so that there is a space between it and the Church Hall hedge. Garden Waste Recycling: The EFDC "Green Bag" garden waste recycling scheme will continue until the end of November. Please make sure that you bag your garden waste separately so that it can be recycled. Collection is on alternate weeks to the "Blue Box" collection. Further bags for recycling are available from the library van on its visits to the village or from the council offices in Epping or Loughton. Revd. David Driscoll to leave St. Mary's: The village is to loose its vicar of the past 12 years the Revd. David Driscoll who is moving onto become Associate Vicar of All Hallows by the Tower in the city of London. David has given sterling support to the village community over his period at St. Mary's and all of his friends here wish him well in his new post. He is due to be installed at All Hallows on 25th November. As David says in the latest edition of the St. Mary's Newsletter, we all pray that the right person is found to be the next vicar at St. Mary's. LOCAL SHOPS, USE THEM OR LOSE THEM: IT HAS BEEN BROUGHT TO THE ATTENTION OF THE PARISH COUNCIL AND OUR WEBSITE THAT ON A NUMBER OF OCCASIONS MUCH TRADE IS LOST TO OUR VILLAGE SHOPS WHEN VILLAGERS SHOP ELSEWHERE FOR ARTICLES WHICH CAN BE PURCHASED FOR THE SAME PRICE IN THE VILLAGE. AS A CONSEQUENCE, AS WE SAW LAST YEAR WITH THE HARDWARE STORE, LIVELIHOODS CAN BE PUT AT RISK AND THEN WE ALL SUFFER. WE ASK YOU TO PLEASE CONSIDER THE LOCAL STORES WHEREVER POSSIBLE FOR YOUR DAY TO DAY SHOPPING, I AM SURE YOU WILL BE MET WITH A FRIENDLY SMILE AND RECEIVE FIRST CLASS SERVICE. THE VILLAGE WEB SITE IS NOW TALKING WITH SHOPKEEPERS AND THE PARISH COUNCIL ABOUT THE PROMOTION OF THE VILLAGE BUSINESSES AS WE MAY NOW BE ABLE TO HELP SHOPKEEPERS TO COMMUNICATE SPECIAL SERVICES OR INFORMATION OVER THE INTERNET. YOU CAN E-MAIL OUR WEB MANAGER OR THE PARISH COUNCIL WOULD BE HAPPY TO DISCUSS ANY PROPOSALS IN THIS RESPECT.